NEVER SHALL I FORGET that night, the first night in camp, that turned my life into one long night, seven times sealed. Never shall I forget the little faces of the children whose bodies I saw transformed into smoke under a silent sky. Never shall I forget the nocturnal silence that deprived me for all eternity of the desire to live. Never shall I forget those moments that murdered my G-d and my soul and turned my dreams to ashes. Never shall I forget those things, even were I condemned to live as long as G-d Himself. Elie Wiesel was 15 years of age when he and his family were forced into Auschwitz and Buchenwald death camps. It is beyond grievous to imagine the mark that this unthinkable horror, total humiliation, unmatched hatred, and the complete contempt for life would leave on anyone’s heart, let alone the tender heart, mind, and spirit of a young man. 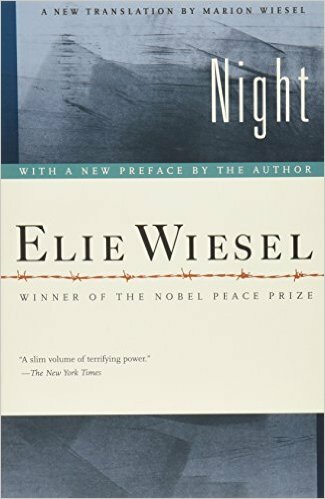 The pain and anguish of that time is felt in much of Elie Wiesel’s works but his memoir, Night, is agonizingly raw. Night reveals where Elie’s struggle with G-d began. But just as Elie never forgot that night, he never forgot G-d.
Night is a short read, only 120 pages. But it is 120 pages of suffering, horror, and honesty, that will leave its mark on your heart. Elie Wiesel ( ז״ל) – may his memory be a blessing and may his words continue to bear witness. Some people might not agree with or ‘like’ Oprah but she was profoundly touched by his memoir Night. This is a sincere interview that started a caring friendship between the two. I had the wonderful privilege of meeting and becoming friends with Paul Argiewicz, who is featured in this famous photo with Elie Wiesel: http://www.israelnationalnews.com/News/News.aspx/175105 He was such a precious man. I’m so glad my children had multiple opportunities to meet him and hear his stories. His story of how he was reunited with his sister after the war is *amazing* – it’s detailed in his book. Wonderful read, if you get the chance! Teresa are you talking about the book by Deanne Joseph – “Number 176520” The Story of Paul Argiewicz? Teresa how blessed to be able to hear the stories from Paul himself. I’m going to see about ordering a copy. Thank you for sharing your and your family’s amazing experience with Paul Angiewicz, Teresa. What a blessing to hear him blow the shofar in Washington DC, and so strongly too! I had to read this book for a philosophy when I was in college. Of all the books I read for that class and many other courses I will “Never Forget this one! That has been a long time ago. I think it is time to read it again. Teresa it had been awhile for me also – I had read it with Roxanne when we were homeschooling and yes it is one of those unforgettable reads.